[icegram campaigns=”1240″]Together with Agile is Critical Chain one of the major contributions to Project Management of the past 20 years. About 15 years ago, I read about Critical Chain for the first time. I was really fascinated about it, but I had no idea how to apply that to my projects. It is not part of standard project management training, while there are many success stories of project organization from around the world. I couldn’t find easily accessible training materials to help me getting started. I didn’t have the tools and missed a community to ask my questions. For me, these were real hurdles. I try to make starting as easy as possible for you. 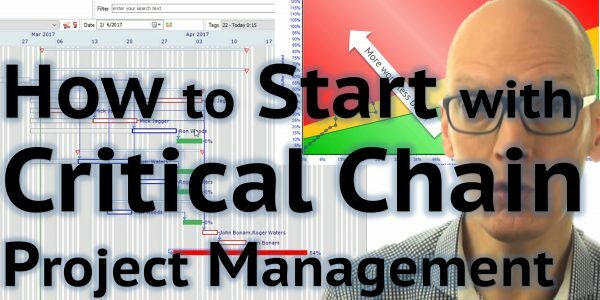 So, you might find it interesting that I created this first video in a series of training videos to help you getting started with Critical Chain Project Management and related topics. You might find it especially interesting that I share my most valuable materials free of charge. To help you with the hardest step. Getting started. You will be able to create real Critical Chain Project Plan, with buffers. You know when you must intervene, or when you must leave your team alone because they are in control. Get instant access to this Online training and much more other valuable training by clicking the button below.